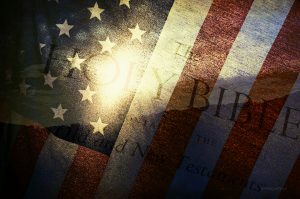 Civil Religion–The Chief Rival of Biblical Christianity in America? One of the most subtle and dangerous temptations Christians face during their pilgrim journey is the allure of civil religion. James Davison Hunter defines civil religion as a “diffuse amalgamation of religious values that is synthesized with the civic creeds of the nation; in which the life and mission of the church is conflated with the life and mission of the country. American values are in substance, biblical, prophetic values; American identity is, thus, a vaguely Christian identity.” (1) Civil religion often functions as an alternative public religious framework for many professing Christians, especially those who accept the “Christian America” myth, or who find exclusive Christian truth claims too controversial to play any significant role in the public square.